When I was younger, and automated car washes first made a big 'splash', I thought it was pretty much the coolest thing ever. Better than sprinklers, even. It was like you were going on a rainforest safari. I'd unbuckle my seat belt and push my face right up against the inside of the window (quickly reprimanded by my mother, of course, for now there were nose prints on the inside that she'd have to fix when she got home). 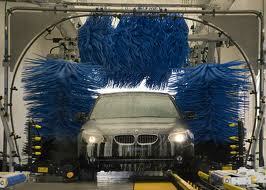 As I got older, the excitement of the technology faded, and with a car of my own, I rarely went to the car wash anyhow. I felt about car washing the same way I felt about hypocrisy -- what good is it to make your car all shiny and pretty on the outside if it doesn't run well to begin with? In one of my favorite passages (Matthew 23), Jesus warns the hypocrites that the outside is not nearly as important as the inside. He flat out tells them it doesn't matter that you look all shiny and professional and classy. It doesn't matter if you have fancy clothes and jewelry, if your house is a flawless mansion filled with riches. It means nothing at all if you smell like perfume and bathe twice a day. If your heart is not right, if there is no love inside of you, if your shiny shell is filled with bitterness and hatred and condemnation, you're in trouble. Verse 27 says, "Woe to you... hypocrites! You are like whitewashed tombs, which look beautiful on the outside, but on the inside are filled with dead men's bones, and everything unclean." Ever take a walk and pass by some roadkill? Yeah, it's gross. It is quite possibly the most disgusting smell in the universe, decomposition. You could put up a little silver cross and a sculpted marble box on top of it, but it still smells and looks disgusting underneath. This is what Jesus is likening the hypocrites to. He is saying that you can clean yourselves up, you can memorize the scripture, you can follow every letter of the law to a T, you can attend church every week, you can lead a bible study for twenty of your friends, you can pray ten times a day on your knees out loud, you can abstain from smoking and drinking and cussing, but if the inside of you isn't right, it makes no difference. Take a closer look at these hypocrites He was talking about: they spent their time with narrowed eyes, looking for others to make a mistake so they could point it out and hold them accountable. They made a big deal of their prayers, wanting people to hear how well they spoke and how thoroughly they knew the scriptures, which meant nothing more than that they were full of pride and arrogance. Everything that was important was lost on them. Love was a concept with which they were not familiar. Blame? Sure! Judgment? Absolutely! But love? Who has time for that? "You cannot love someone and judge them at the same time" is one of several paraphrases of a quote attributed to Mother Teresa. Since Jesus said the two greatest commands were to Love God and Love Others (Luke 10:27), judging people gets in the way of doing what we are meant to do. Making ourselves look great on the outside defeats the purpose of both of these commands -- we need to change our focus from polishing ourselves up to look perfect, and put our focus instead on loving others WHERE THEY ARE, and FOR WHO THEY ARE. It's not up to us to judge or to change people. It's up to God. If we're inaccessible because of our fake perfection, how are we ever to lead others at all? I'm a real person. I drink margaritas. I say bad words from time to time. I get angry, frustrated, and sometimes fly into a road rage. I worry, I fear, I get mad at God and yell at Him once in a while when things don't go my way. I quit smoking seven years ago but crave cigarettes every single day of my life. I don't always put my shopping cart in the corral. That describes every single one of us on the planet, and if we try to claim we are above sin, not only does it make other people not want to be around us, it makes us liars. (1 John 1:8) Jesus, who actually never sinned, didn't try to shine and polish Himself up on the outside. He came to us. He gave up riches and glory and heavenly perfection to get down in the dust and dirt, to walk around with loud-mouthed, cursing fishermen, to sit and talk with prostitutes and tax collectors, to fellowship with straggling wanderers who didn't understand much of what He said, but certainly wanted to be around Him because of the loving, caring, kind way He treated each and every one of them: the lame, the blind, the lepers, the shunned, the adulterers, the cheaters, even the ones who betrayed Him. Don't bother wasting time trying to be perfect. Nobody is, and nobody can be. The best thing we can do is get our hands dirty helping and loving anyone and everyone we come across on our Journey. It can be a bigger challenge than expected, just trying to live that life of love! this is encouraging. MY life doesn't feel together on the outside - my house is a mess, so is my yard, my cars are not pretty, my kids are dirty from playing outside, and I'm lucky to get a shower... it's easy for me to fear judgment on those things. Thanks for reminding me that those things don't matter, it's the love that's in my family that matters. For some reason, this is a HUGE battle I'm fighting with myself, and it's SO HARD to let go of the need to look good on the outside.